George Platt Lynes, Paul Cadmus and Jared French, 1937. The centrifugal drive behind much of the work featured in the Barbican’s Modern Couples: Art, Intimacy and the Avant-garde is enunciated by Rodin in the first gallery: ‘I express in a loud voice what all artists think. Desire! Desire! What a formidable stimulant.’ By exhibiting the work of artistic couples, including letters, books, music, and visual art, the show aims to demonstrate how desire affects artistic practice, and how artistic practice affects desire; we see how each inflames, distorts, inspires and destroys the other. 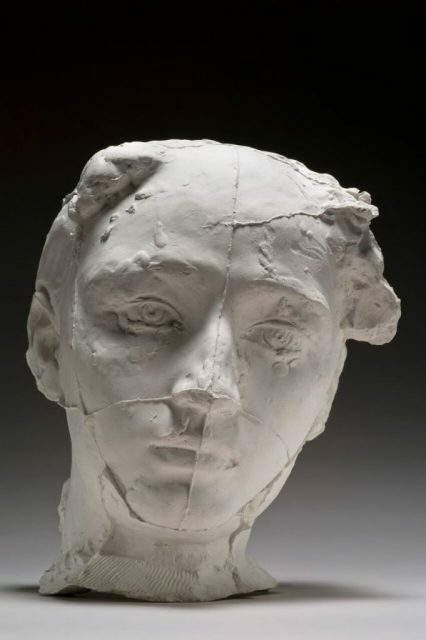 Auguste Rodin, Mask of Camille Claudel, 1889. 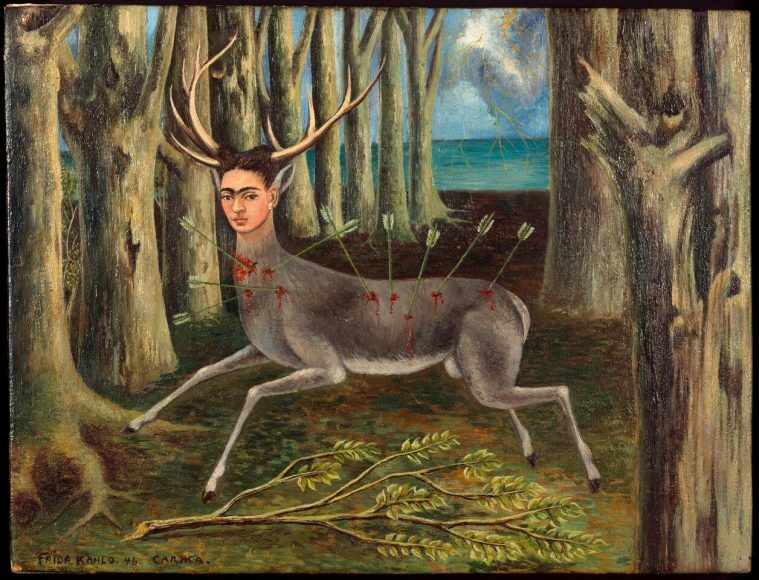 Frida Kahlo, La Venadita, 1946. The show begins with two couples, sculptors Auguste Rodin and Camille Claudel, and composers Gustav and Alma Mahler. Both relationships took place at the end of the 19th century and retained patriarchal inflections which subsequent artist-couples strove to shed. Rodin encouraged Claudel’s work and collaborated with her on some fine clay miniatures of lovers entwined like tree roots. But the bust of her featured here, with the joins of the cast visible, hints at the cracks beneath the surface; in 1905 she was diagnosed with schizophrenia and confined by her brother to an asylum for the last 30 years of her life, despite doctors trying to convince her family that she was well enough to leave. The case of Alma Mahler is probably the only instance in the show of one half of a couple trying to inhibit the work of the other; Gustav felt his wife ought to support him to an extent that would leave no time for her own compositions. However, after consulting with Freud he relented and we have the results here; beautiful and haunting next to the bombastic scores of her husband, Alma’s work is a highlight of what this exhibition does so well: show us the unknown work of the other half. The majority of the exhibition is dedicated to avant-garde artists of the early 20th century: couples like Salvador Dalí and Federico Garcia Lorca, Virginia Woolf and Vita Sackville-West, Raoul Hausmann and Hannah Höch. It is in this period when notions of desire began to open up alongside artistic visions: we have ménages-à-trois or more, polygamy, gay and lesbian relationships, swapping, transsexualism, and interracial affairs running in parallel with Surrealism, Rayonism, Orphism, and the birth of photography as an art form. The exhibition’s strongest and weakest points are to be found as we progress through this period. Its exploration of large networks allows us to make new connections between disparate artists; I came to Romaine Brooks’ portraits of Luisa Casati and Natalie Clifford Barney in the context of a cross-Channel network of lesbian artists including Woolf, Djuna Barnes, and Gertrude Stein. What drew me to Brooks’ paintings were the backgrounds, indistinct but hinting at underlying structure. We see the features of an English coastline and a Paris street blurred by mist, a technique which aligns these prosaic settings with (in the portrait of Casati) an abstract Erebus in which the subject appears as sorceress or Fury. 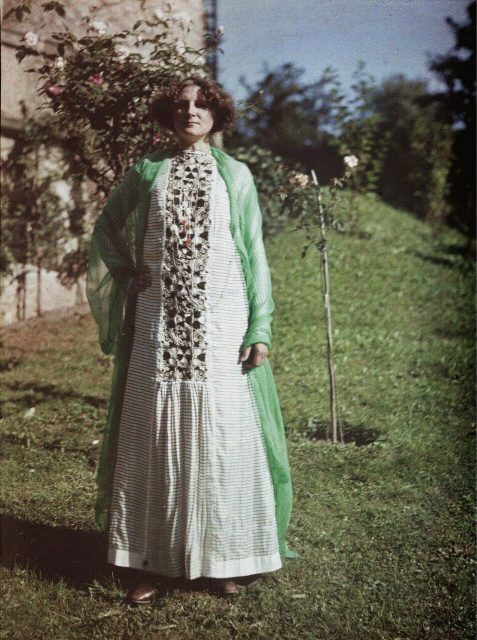 Fritz G Walker, Emilie Flöge in Chinese Imperial Costume from the Qing Dynasty in the Gardens of the Villa Paulick in Seewalchen at Attersee 13th or 14th September 1913, 1913. 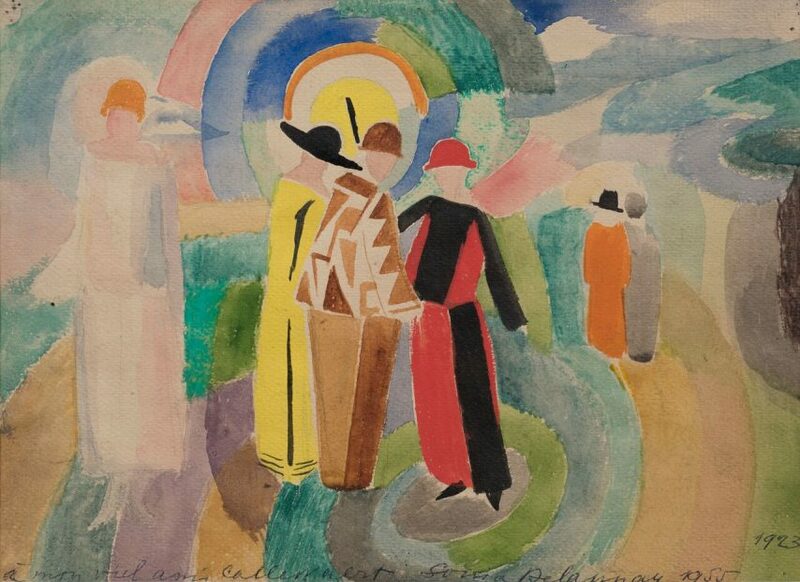 However, as we expand beyond the well-trodden paths of modernist Paris, London and Vienna, the show loses its focus. That’s not to say there isn’t wonderful work here: the photography of George Platt Lynes, Paul Cadmus and Jared French is beautifully composed, and Sonia and Robert Delaunay’s respective textiles and paintings echo one another with ecstatic vibrancy. But as couple after couple is introduced with only enough space to show a few works, the exhibition fails to give a wide enough representation of their respective oeuvres or only includes minor work, and I left feeling overwhelmed with small portions. I understand and encourage the desire to go beyond the familiar, but when introducing lesser known artists like Lavinia Schulz and Walter Holdt it would have been advantageous to allow their work more time and space. The sheer scope and ambition of the exhibition can make individual pairings feel rushed. That said, though several couples failed to make an impression, there is such a range of work in different mediums and different styles here from so many artists that whatever their background, visitors are bound to be pleasantly surprised by at least one new discovery. I came away with amazement at Delaunay’s textiles, handmade with colourful repeating patterns which pop and fizz like champagne and fireworks, and with an appreciation for Eileen Grey and Jean Badovici’s efforts to create a fluid, interactive architecture against Le Corbusier’s ‘machine for living’. And despite Claude Cajun’s letter to Marcel Moore in which he said ‘I am the work of your life’, the show thankfully resists biographical interpretations of the art. We get the necessary information of who knew whom, for how long and where, but no generalisations such as that art and passion cannot coexist before one destroys the other. In fact on one wall a timeline of each relationship demonstrates the surprising longevity of many of the couples: Benedetta and Filippo Marinetti together from 1918 until 1944, Varvara Stepanova and Alexander Rodchenko from 1914 to 1956, Natalia Goncharova and Mikhail Larionov from 1907 to 1962. All three groups remained couples until the death of one of their members. Modern Couples is a significant show, an extensive survey of modernism that embodies an original viewpoint which genuinely sheds new light on the period, and will hopefully lead to further such explorations. Though somewhat overambitious in its attempt to include so many artists, it nevertheless offers abundant surprises and delights. Modern Couples: Art, Intimacy and the Avant-garde will be at the Barbican Centre until 27th January 2019. More information here. 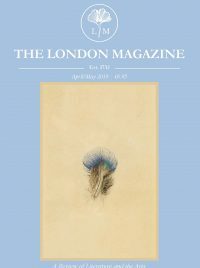 Previous articleThe London Magazine Poetry Prize 2018 – Winners Announced!